The 2018 Startup Summer Camp is scheduled to be held at UNIST from August 6 to 9, 2018. 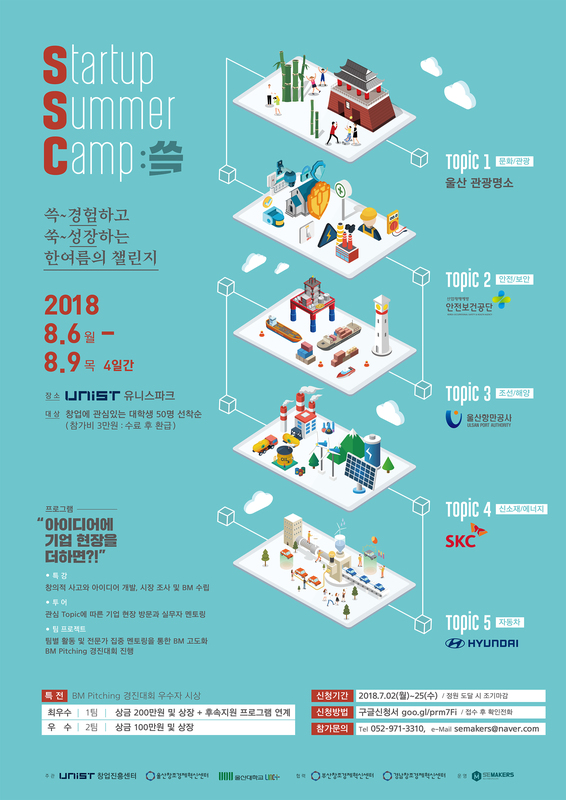 The 2018 Startup Summer Camp is scheduled to be held at UNIST from August 6 to 9, 2018. Over the course of four days, young entrepreneurs will stay at UNIST campus and engage in various startup events, which include attending local startup meetings, keynote talks, and joining entrepreneurship challenges. 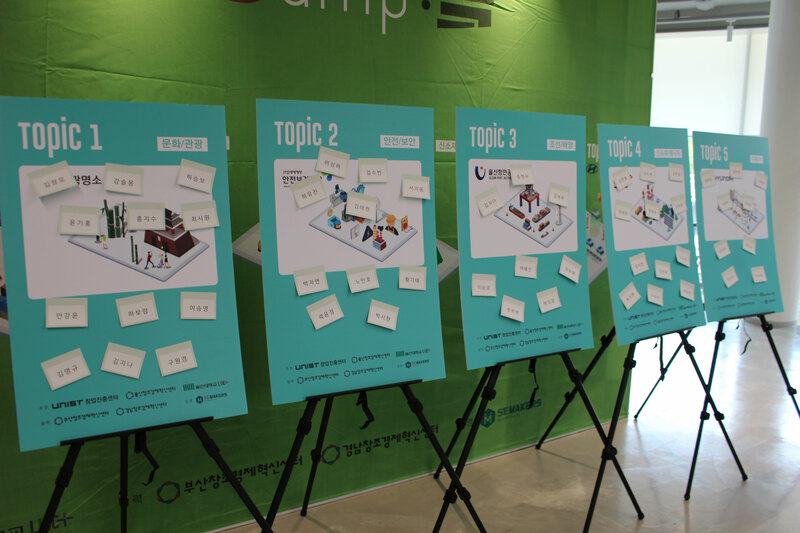 The primary purpose of this event is to provide university students in the southeast areas of Korea, including Ulsan, with the know-hows to run a startup and to create opportunities for new business models. Participating students can select the desired fields of entrepreneurship and get a chance to meet with practitioners for mentorship. During the course of the event, students will have direct exposure and hands-on experience in five different areas in connection with the regional industries in Ulsan. The hands-on experience will be held on the second day of the event and consist of the following field of areas: Culture/Tourism, Safety/Security, Shipbuilding/Marine Engineering, Energy/Materials Engineering, and Automobile. The Business Model Pitching Competition is scheduled to be held on the last day of the event on August 9, 2018. Through a thorough screening process, one best team and two excellent teams will be selected. Both follow-up support and the prize money of two million won will be given to the 1st place winner. The prize money of one million won shall be also given to the other remaining winning teams. “UNIST has been actively supporting the growth of young entrepreneurs to create a new business environment not only in Ulsan area, but also in the Southeast of Korea,” says Director Sung Chul Bae of the Office of University Industry Relations at UNIST. “This program introduces students to the entrepreneurial mindset and provides them with hands-on training in high-impact entrepreneurship”. This year, a total of 48 students from 15 universities have been selected to partake in the program, among which the highest rates of participation were Ulsan and Busan. 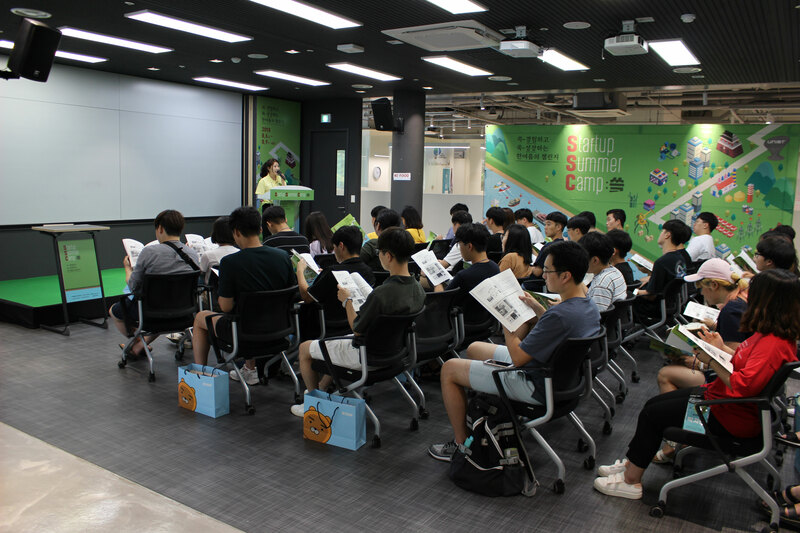 Meanwhile, the 2018 Startup Summer Camp has been jointly organized by the UNIST Business Incubation Center, Ulsan Center for Creative Economy and Innovation, and the LINC+ Enterprise Organization at University of Ulsan in collaboration with the Busan Center for Creative Economy and Innovation and the Gyeongnam Center for Creative Economy and Innovation.